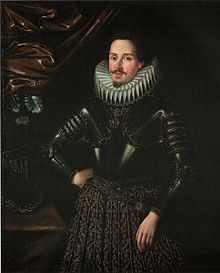 Ferdinand I Gonzaga (26 April 1587 – 29 October 1626) was Duke of Mantua and Duke of Montferrat from 1612 until his death. Born in Mantua, he was the son of Vincenzo I and Eleonora de' Medici. He was appointed a cardinal at the age of 20. A few years after his elder brother, Duke Francesco IV, died in 1612 without heirs, he renounced the ecclesiastical career and succeeded his brother in both the Duchy of Mantua and the Duchy of Montferrat. In 1616 he secretly married Camilla Faà di Bruno, whom he divorced in the same year. Their son Francesco Giacinto Teodoro Giovanni Gonzaga, although accepted at court, was not made Ferdinando's heir. He died of the plague—or was murdered—during the 1630 siege of Mantua. On 16 February 1617 he married Catherine de' Medici (1593–1629), the daughter of Ferdinand I, Grand Duke of Tuscany. Ferdinand Gonzaga died in 1626. His younger brother Vincenzo II inherited the duchy. Francesco Giacinto Gonzaga (4 December 1616 – 1630), Lord of Bianzè since 1624, benefited Priest of St. Benedict Polirone. This page was last edited on 20 April 2019, at 10:32 (UTC).